Hydrocephalus literally means “water on the brain” and refers to conditions where there is an abnormal build up of cerebrospinal fluid (CSF) in or around the brain. About 750ml of CSF is normally produced inside the brain per day. Hydrocephalus is usually caused by a blockage somewhere in the system, preventing CSF from either flowing around the brain, or from draining back into the blood stream. The treatment for hydrocephalus is usually insertion of a ventriculo-peritoneal (VP) shunt. This requires an operation under general anaesthetic that takes around 45 minutes. A small silicon tube is inserted into the fluid space in the brain via a small burr hole in the skull, connected to a valve and then tracked under the skin across the chest and abdomen to be placed into the abdominal space. This drains excess fluid from the head, in a controlled way, to be eventually absorbed by the tissues around the abdominal cavity. In this syndrome, known as NPH, patients complain of gait difficulty, unsteadiness, short term memory problems, dementia and sometimes incontinence. The exact cause is unknown but it generally affects people in their 70’s or 80’s. There is no definitive test for this condition but investigations will include MRI scans and sometimes lumbar puncture (spinal tap) tests and physiotherapy assessment. 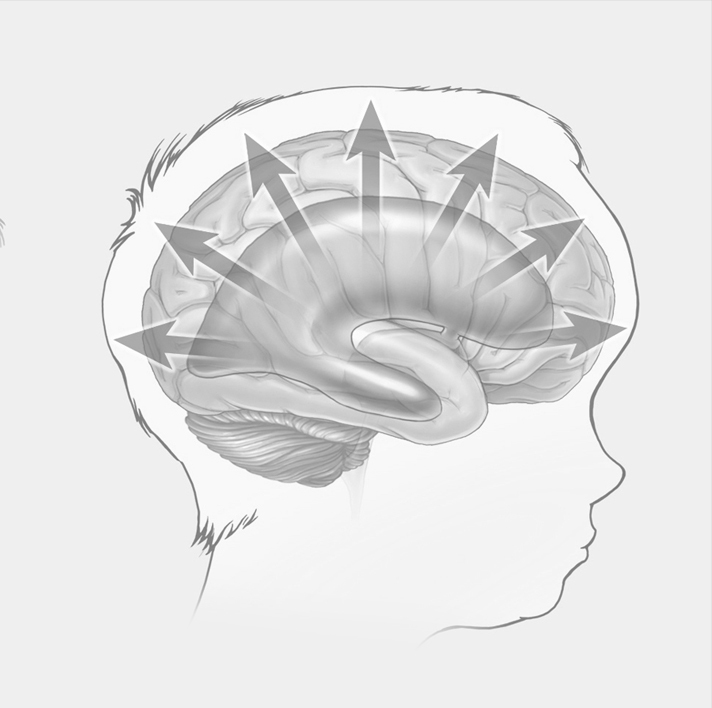 As with other causes of hydrocephalus, the treatment is generally with a shunt. Programmable shunts are now available, which allow the clinician to change the pressure setting of the shunt using a computer device with a magnet. This means that the shunt treatment can be individualised and adjusted, completely non-invasively, allowing finer control of the pressure and flow settings as necessary. A skull of a patient with hydrocephalus from the late 1800’s in the Hunterian Surgical Museum, London. Before shunts were readily available in the 1950’s, hydrocephalus was a difficult condition to treat, and sometimes led to gross enlargement of the head in children.